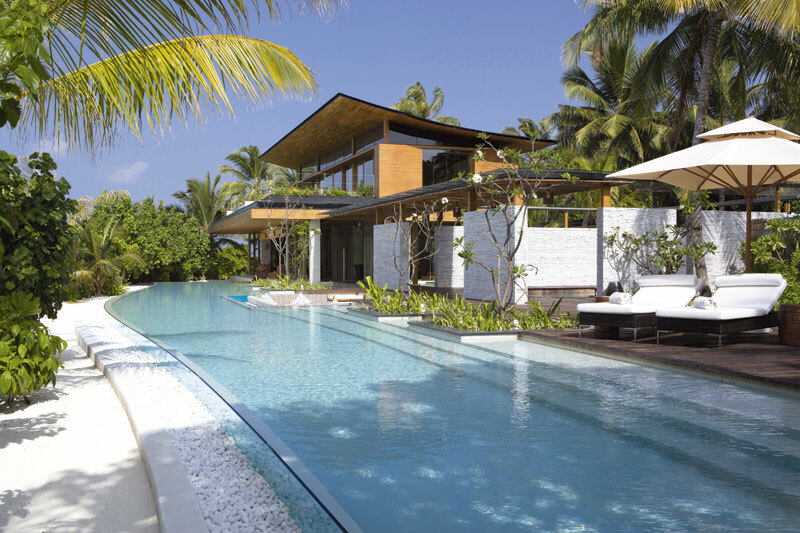 This newly opened private island resort lies in the pristine North Malé Atoll in the Maldives in the Indian Ocean. An underwater mountain range is hidden in the surrounding waters. As with any private island, the draw of CoCo Privé is the total seclusion, discretion and protection from the outside world. With accommodation for just 12, activities are designed around guests: daily life here is tailored to the preferences not only of a group but of each individual within it. Arrival is via the resort’s own 30-metre Azimut, so you’ve escaped normal life before you even step on to the sand. Whatever you want from your time off, you’ll find it here. On the water, explore astonishing reefs and even plant your own, or join the on-hand dive-master to find the best secret underwater havens. Guests can also go windsurfing, waterskiing, paddleboarding, kayaking, catamaran sailing and deep-sea fishing, all in the privacy of an exclusive group with no one else in sight. Spa treatments are available in-room or at the spa villa and a private personal host can arrange other experiences, such as picnics on the sandbank or nights sleeping under the stars. iPad. Outside is an infinity pool looking out on to the ocean, and a sunken seating area is ideal for alfresco dining. There are five further villas, designed in a modern, clean style by Singapore- based Guz Wilkinson, all with expansive living spaces, easy beach access and either private or shared pools. Before a group’s arrival, each guest supplies food and activity preferences to ensure every individual’s experience at the resort is perfect for them. The island’s private chef prepares meals 24 hours a day at guests’ convenience (there’s a sommelier on-site for matching). Guests can also dine at restaurants in the neighbouring five-star resort Coco Bodu Hithi (ten minutes by boat) ranging from Japanese speciality cuisine to seafood barbeques. Transfer from Malé international airport is 40 minutes by the resort’s yacht. Private jets can also land here. Marina facilities in the Maldives are too small for most superyachts but boats are able to anchor outside the area’s resorts.